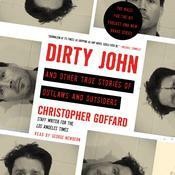 Christopher Goffard is one of America’s most acclaimed literary journalists. He has written for the St. Petersburg Times and the Los Angeles Times. He is the author of You Will See Fire: A Search for Justice in Kenya, based on his Los Angeles Times series; the novel Snitch Jacket, which was a finalist for the Edgar Allan Poe Award for Best First Novel; and Dirty John and Other True Stories of Outlaws and Outsiders. His work appears regularly in the Best American Newspaper Narratives series.